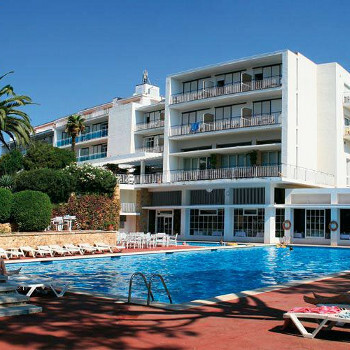 Situated right in the centre of Costa Brava lies the 53 room Alga Hotel. This modern hotel offers two swimming pools, games room and lounge to name a few but if this isn't for you there are a lot of local attractions to visit right on the Alga's doorstep. We booked a Double Garden Room at Hotel Alga with one telephone call and email confirmation a fortnight in advance. Early June 2005. Rate was 95 euro per night, b&b, less 20% for a stay of 6 nights or more. Separately booked flights via Ryanair (Luton/Girona) and car hire (Carjet). All very simple and good value. Reasonably straightforward journey from Girona airport and hotel easy to find on reaching C. de Palafrugell. Hotel is well situated just 350 metres from the sea front. Looks a bit 'blocky' from the road but well appointed inside with large reception, bar, lounges etc. Lovely gardens to rear with large pool (rare for the area) and a tennis court. Rooms were simply furnished but very clean. Good continental breakfast provided on terrace overlooking gardens and pool. This is not a package tour hotel - nor resort for that matter. Suits couples and families looking for a low key holiday in a largely unspoilt area of the Costa Brava. Hotel and resort were quiet during our week (early June), but busier over the weekends. In fact, hotel and pool bars were closed during the week. No 'entertainment' to rate as such, just a nice quiet base from which to enjoy the holiday.